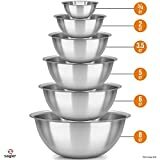 This listing features a Stainless Steel Mixing Bowls by Finedine (Set of 6) ¾, 1.5, 3, 4, 5, & 8 Quart. New in damaged box. Product not affected. 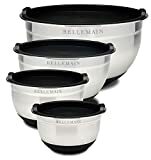 Item Specifics: With graduating sizes of ¾, 1.5, 3, 4, 5 and 8 quart, the bowl set allows users to be well equipped for serving fruit salads, marinating for the grill, and adding last ingredients for dessert. Stainless steel bowls with commercial grade metal that can be used as both mixing bowls and serving bowls. These metal bowls won't stain or absorb odors and resist rust for years of durability. 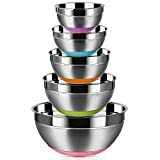 An easy to grip rounded-lip on the stainless steel bowl set makes handling easier while a generous wide rim allows contents to flow evenly when pouring; flat base stabilizes the silver bowls making mixing all the easier. A space saving stackable design helps de-clutter kitchen cupboards while the attractive polished mirror finish on the large mixing bowls adds a luxurious aesthetic. This incredible stainless steel mixing bowl set is refrigerator, freezer, and dishwasher safe for quick and easy meal prep and clean up. They'd also make a great gift! QUALITY CONSTRUCTION. 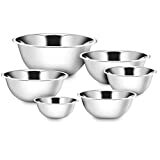 Resistant to dents and rust, these mixing bowls are durably crafted of high-quality, heavy-gauge stainless steel to provide long-term strength and ensure you get extensive use out of them for years to come. EASY TO USE. Measure, mix and store your food in the same convenient bowl. These mixing bowls boast deep construction to allow for generous servings and less mess, along with a flat base for increased stability when mixing. VERSATILE USE. Easily mix your cake batters and cookie ingredients, marinate meat for the grill, or make tasty sauces and dressings inside the Klee Utensils Mixing Bowls. 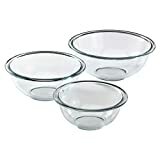 You can also use these bowls for serving fruit, tossed salad, chips and much more. A great addition in any kitchen, the Klee Utensils Set of 6 Mixing Bowls allows you to measure, mix and store all of your ingredients and food in the same convenient bowl. If you didn’t already love cooking meals and baking yummy treats, you will now. Plastic bowls may scratch and break over time, but these mixing bowls are made to last. Expertly constructed of high-quality, heavy-gauge stainless steel, these sturdy bowls won’t rust or dent to ensure continual use for years on end. Furthermore, the material doesn’t retain odors or leach harmful chemicals, ensuring a safe eating experience each and every time. Designed to make life easier in the kitchen, this set comes with six mixing bowls – ranging from a small ¾ -quart up to an 8-quart size to accommodate all of your measuring and mixing needs. The different-sized bowls can be conveniently nested together, taking up less cabinet space when not in use. Each bowl boasts deep construction to allow for generous servings, along with a rounded lip for easy handling and pouring. Additionally, the bowls are equipped with a flat base to provide increased stability during your food prep. Boasting a shiny interior and a satin metal exterior, these mixing bowls will enhance and brighten any kitchen decor. Each bowl is refrigerator, freezer and dishwasher safe for added convenience, allowing you to refrigerate or freeze ingredients in the same container. Then when needed, you can simply pop it in the dishwasher for quick and easy cleaning. The OXO Good Grips Mixing Bowls are great for whisking eggs, mixing batter and making marinades. 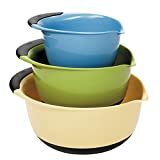 These 1-1/2, 3 and 5-quart Bowls feature soft, comfortable, non-slip handles that are easy to grip. Non-slip bottoms stabilize the Bowls while mixing, and wide lips and spouts make it easier to pour ingredients. The Bowls come in blue, green and yellow and nest neatly for convenient storage. Arc bottom with smoothly, no dead corner when clean. The bowls can be still shine after washing with water and soap or in the dishwasher. The bowls has clear accurate etched volume measurement mark for your accurate needs. Plus non slip colorful silicone bottoms, it looks colorful, attractive to eyes and easy to identify. And it also stable when you operate. Don't worry! It enables to store the bowls one inside the other - 5 IN 1, saving storage space in your kitchen! Besides, it is easy to pick a bowl out of the nested set. Polished mirror finish inside will remain shiny lasts and lasts, just like new ones! An easy to grip rounded-lip on the stainless steel bowl set makes handling easier. Deepen design, no worry about spatter when you are doing egg beating and whisking. Order Your Own Set Of Stainless Steel Mixing Bowls Today. You would love the product and if not you will get your money back!